Liverpool striker Luis Suarez has been named Player of the Year by the Football Writers' Association. The Uruguayan, 27, has scored 30 Premier League goals for a team chasing their first title since 1990. 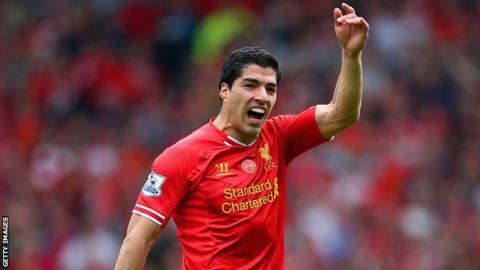 Suarez took 52% of the vote, with team-mate Steven Gerrard second and Manchester City's Yaya Toure in third. "Tireless endeavour allied to extraordinary imagination makes an irresistible combination," FWA chairman Andy Dunn said. "Add ingenious, impudent finishing and you have a footballer who truly quickens the pulse." Suarez, also named Player of the Year by the Professional Footballers' Association, will receive his award in London on 15 May. More than 300 journalists cast votes for the 10 nominees for the award, which was first won by Blackpool's Stanley Matthews in 1948. On Sunday, Liverpool manager Brendan Rodgers said Suarez had been "outstanding in all my time here and obviously, in particular, this season". "To know that he's happy is important, like it is with all of our players," he added. "It's very important that we have players here that are content, happy and focused on Liverpool." Suarez's tally of 30 goals has come despite the fact that he missed the first six matches of the season as he completed a 10-match domestic ban for biting Chelsea defender Branislav Ivanovic during a league match at Anfield in April 2013. The former Ajax striker's Liverpool future was in doubt last summer. He indicated in May that "it would be difficult to say no" to Real Madrid, then told journalists in August that he wanted a move so that he could play in the Champions League. However, he signed a new four-and-a-half-year contract in December.